Make notes in sequencer legato? Is there a way to make all the notes legato in the sequencer after you have entered them. But not one at a time but like in Logic there is a choice to make all notes selected legato. Is this possible in BM2? Thank you. Group select all notes you want legato, then turn off 'grid quantise' and extend the length of the last note in the series as much as you need so that your group of notes start to overlap. Sometimes you have to go in and make some further tweaks, for example if some of your notes are spaced much further apart than the rest, but this technique usually gets you 90% of the way there in 3 quick actions. Thanks I will give this a try. Do you turn quantize back on? After. Hold on a second... are you using BM2 or BM3? @tk32 I typed up a reply similar to yours at first but then stopped when I realized they're talking about BM2 hahaha. Just opened BM2 to check, and you can select all notes by double tapping the select tool, and you can use the resize handle to make the notes overlap, but it took me a minute to find the quantize/grid setting, which goes up to 1/96 rather than "free". So it works kinda the same! Not sure about the iPhone version but the iPad version has the quantize/grid setting to the left of the undo button at top right. I don't think the app can do what I want. if anyone has Logic they may or may not know the use of "Make all notes Legato" I wouldn't expect an app to do what a full Daw is doing but thought maybe it would. Thanks I want the notes to fill the grid but not over lap. 2. Extend the notes so they overlap (using the group select technique previously described) and then adjust the synth or instrument to work in 'legato' mode. This usually means a combination of (a) reducing polyphony to 1, and/or (b) turning on a synth's 'Legato' mode. As I mentioned before, whenever I need legato —say a bass track, for example— I can still achieve exactly what I need with overlapping notes, provided I setup my synths/samples to work in Legato mode. I guess the easiest way for me to do it is to just bring it into Logic via MIDI file and do it there the Synth in legato mode would still make a midi file with over lapping notes. Can't use that. 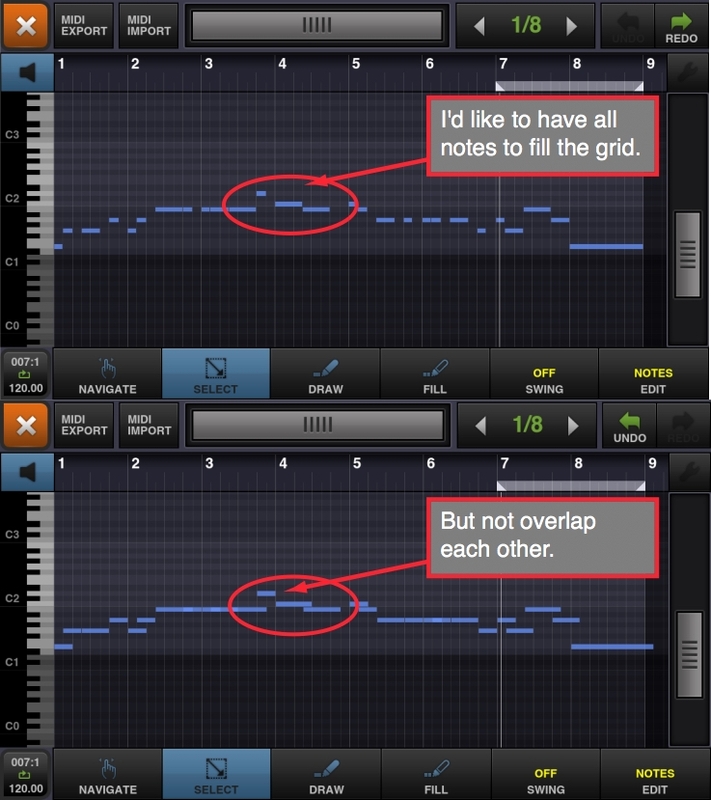 Although Logic can fix over lapping notes as well. But No way to get Logic on my iPod and I do like BM2. So thank you everyone for your kind advice and I want you all to know I appreciate it. I'm considering this solved. This would be a nice function to a 'process midi' menu if/when we get something like that. Just make a selection and choose 'process midi -> legato/overlap'.